But, trying to keep up with the times, in 1983 it was divided into five theaters. 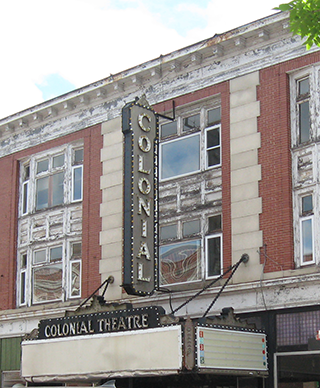 This multiplex idea didn’t succeed, and when I wrote my 2011 piece the Colonial had closed and been put up for sale. Last year a miracle happened. Through the Belknap Economic Development Council, 609 Main Street LLC bought it and embarked on a $15 million restoration and renovation project. This spring, work began. 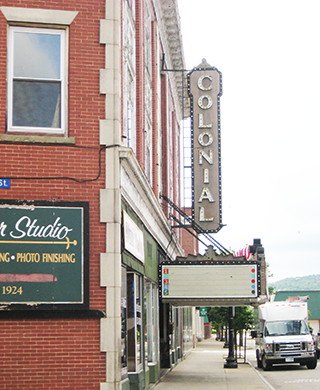 In photographs in the Laconia newspapers we’ve seen the removal of partitions and five projection booths and the dropped ceiling. We’ve read th at the method is more “disassembly” than demolition. Gradually what we remember is being revealed, such as the beautiful murals and proscenium arch. The movie theater’s property includes several stores along Main Street and a side street, Canal Street. On Snowy and Tom’s first date, he parked his Chevy convertible on just such a side street around the corner from the theater. Three of the Canal Street businesses have had to look for new premises, because they were built in the location of the original entrance to the stage, through which, as the Laconia Daily Sun reports, “elephants and automobiles along with stage sets, sound equipment, and other large items once passed.” Don and I wish we’d known in our youth about those elephants in the theater’s early history. Here is that piece describing our own Colonial Theater history.